Are there tutorials available for XCTU, or user manuals? Yes, there is a complete help system built into the XCTU interface. Visit the Digi YouTube page for video-based tutorials. Can you program DigiMesh with legacy XCTU? We recommend customers use the new and improved XCTU. Legacy XCTU may still work with some products, but it is no longer supported or updated for new releases. Can I use the new XCTU on older versions of Xtend RF Radios? Yes, but certain features of XCTU may not work with older versions of XTend radios. Does hardcoding PAN ID and Channel as used in DigiMesh modules have any disadvantage? Hardcoding the PAN ID does not have any significant disadvantage, but note that some products require the use of multiple channels, but the channel range can be selected and configured as desired. Digimesh networks are configured by setting the Pan ID and operating channel. This method lends itself to very simple network formation as no association mechanism is involved. Zigbee uses an association process where routers and end devices receive the operating PAN ID and channel upon joining the network. One advantage of this system is that joining can be disabled. For a network of 400 nodes, with up and down communication, which is preferable, Zigbee or DigiMesh? Both mesh protocols can work for this network if configured appropriately. DigiMesh is slightly easier to architect simply because there is no need to select different node types. Can we use your gateway and connect it to our cloud? Yes, this is an option for most XBee modules. Can out-of-the-box configuration items be modified via a broadcast or unicast in both Zigbee and DigiMesh? Yes, Zigbee and DigiMesh nodes can be configured over-the-air. What’s the range of these 900HP DigiMesh Kit modules? Range for the XBee-PRO 900HP is up to 9 miles with high-gain antenna. This can be increased by adding additional hops to the network. We are planning to use Zigbee Mesh network to collect the data from battery powered movable sensors. The sensors will be distributed in two physically apart buildings where there are no wireless connection from one building to another building. Could you please let me know the best way to setup the network, considering moveable sensors will move from one building to another building and should join the network as soon as they enter the range of Zigbee network in another building. With Zigbee you would need to have some mechanism to instruct the module to leave the current network and attempt to join the other. This could be accomplished with a network watchdog timer that checks for the presence of a coordinator and if none is found will reset and join another network. XBee Zigbee radios also have a feature called join verification that can be set to check for the presence of a coordinator on a power reset and reset its network settings if none is found. Digimesh could accomplish this by setting both networks with the same PAN ID and Channel credentials, then moving from one network to the other would be seemless. Any DigiMesh Kits including Raspberry pi projects? We don’t have any Raspberry Pi projects in our current kits. However, there are plenty of RPi project examples on the web. What comes in the kits that are on the screen? Do these modules require a Digi concentrator and/or cloud or are they compatible with 3rd party systems? Digi Gateways can be used with our Zigbee and 900HP DigiMesh modules to connect them to cloud-based applications. Zigbee modules can also be used with 3rd party gateways, but there could be some compatibility issues depending on the implementation of the Zigbee protocol on the 3rd party gateway. Customers that need a gateway to connect their devices to an IP-based system are suggested to use Digi gateways. When addressing a Zigbee node, is it required to use both the 64-bit address AND the 16-bit ID address? Frames may be addressed using either the extended(64 bit) or the network address (16 bit). If the extended address form is used, then the network address field should be set to 0xFFFE (unknown). If the network address form is used, then the extended address field should be set to 0xFFFFFFFFFFFFFFFF (unknown). If an invalid 16-bit address is used as a destination address, and the 64-bit address is unknown (0xFFFFFFFFFFFFFFFF), the modem status message will show a delivery status code of 0x21 (network ack failure) and a discovery status of 0x00 (no discovery overhead). If a non-existent 64-bit address is used as a destination address, and the 16-bit address is unknown (0xFFFE), address discovery will be attempted and the modem status message will show a delivery status code of 0x24 (address not found) and a discovery status code of 0x01 (address discovery was attempted). What relative humidity or IP rating can the “raw” PCAs operate in? Do you have any office in India which can support us in developing the application, across the table or over the phone? Digi no longer has an office in India, but support is available through our US offices. Is there a DigiMesh kit available for Europe (868 or 2.4)? There is not currently a DigiMesh kit available for 868LP or DigiMesh 2.4 modules. Does DigiMesh come with a cellular and or satellite gateway? Yes, available in the ConnectPort X4 and X4H. Is there a notion of sustained broadcast rate that can be claimed? Like 9600 baud, 19200, etc. What is expected of transmitting node, in terms of backing off? Each node that transmits the broadcast will also create an entry in a local broadcast transmission table. This entry is used to keep track of each received broadcast packet to ensure the packets are not endlessly transmitted. Each entry persists for 8 seconds. The broadcast transmission table holds 8 entries. This process creates an approximate once per second maximum sustained broadcast rate. System generated broadcast events can also occur so careful testing should be performed to estimate any network’s specific throughput capabilities. Can XCTU be used remotely? XCTU can be used to configure locally connected nodes and ‘remote’ nodes connected to your network over-the-air. What’s the difference between the 900HP modem and the Xtend modem? They are similar in terms of performance and functionality. The 900HP modem is less expensive, and slightly lower range than the XTend. Which antenna are recommended to maximize transmission across water? High-gain directional or omni antennas provide strong performance across water and land. Note that over both water and land, the higher the antenna, the more likely you are to achieve unimpeded line-of-sight range. What do you mean by complex deployment? Large mesh networks are considered complex deployments. Zigbee networks can be slightly more complex than DigiMesh, simply because the node types need to be defined for every node on the network and there must be a powered coordinator defined for the network to operate properly. Zigbee nodes: What if a coordinator stops working? The coordinator can be a point of failure for a Zigbee network. Can Zigbee module work like mesh? Yes, Zigbee modules operate in mesh networks. Not a strong market opportunity to drive the creation of this product. If you have customers interested in this technology, please let the Product Management team know. How do the modules differentiate between the line-of-site and a reflected packet? Multipath signals can create destructive interference when they arrive out of phase with a direct signal at the receiving antenna. This generally results in fading or weakening of the received signal. Is there a limit on the size of data that can be transmitted? Or a good practice / recommendation to deal with larger datasets? If using API mode, there is a maximum payload size that can be included with each API frame. This size will vary with different versions of XBee module but can always be queried with the NP command. With unicast will each node of a network repeat packets or does the mesh network only repeat packets on nodes that it knows are on the path to the final node? Only modules involved in the routing of the data will retransmit the packet. Which module you recommend for smart street lighting , and how is the communication traffic managed? Can every lamp on the network talk to each other? We have intelligent street lighting customers using Zigbee and DigiMesh technology. In both network types, every lamp on the network can communicate with one another. Each technology has pros and cons, it comes down to customer preference. Two part question:What is the advantage of directed broadcasting (i.e., defining a destination address)? Does this improve communication speeds of data to the ‘host’? Directed broadcasting does not improve the communication speed of data to the host but it does simplify addressing as it allows you to address data to a specific module. Otherwise you would need an identifier in the payload of your broadcast packet to inform the desired module to reply. It also limits the amount of extraneous data that will be presented to host applications. My question is why South America (Argentina) is not listed in market for 900HP Digimesh? 900HP DigiMesh modules can be used in Argentina, there are no specific certification requirements for that region. I already got the zig bee mesh kit a couple weeks ago… I have an xbee shield for arduino, do I need anything else to get started? Nope, you are ready to go build your own XBee-enabled prototype! Is there any possibility to compress/decompress data before/aftrer zb/digimesh transmission? The XBee radios are serial radios. Any binary data can be transmitted via an XBee Radio. A JPEG image is a good example of a compressed file that could be transmitted via an XBee. Would you briefly compare these to the Wireless HART and ISA100 devices/standards? WirelessHART and Zigbee share IEEE 802.15.4 as the basis of their physical layers. This allows them to use essentially the same hardware at about the same cost for transmitting and receiving. WirelessHART uses TDMA, which allots individual time slots for each transmission. Zigbee uses CSMA with collision detection. In WirelessHART, each node operates as a router, which is similar to that of DigiMesh. Can I code the modules or must I use an external processor? Digi does offer ‘programmable’ variants of both Zigbee and DigiMesh modules, which includes an 8-bit microprocessor onboard the module that can be programmed with a custom application. 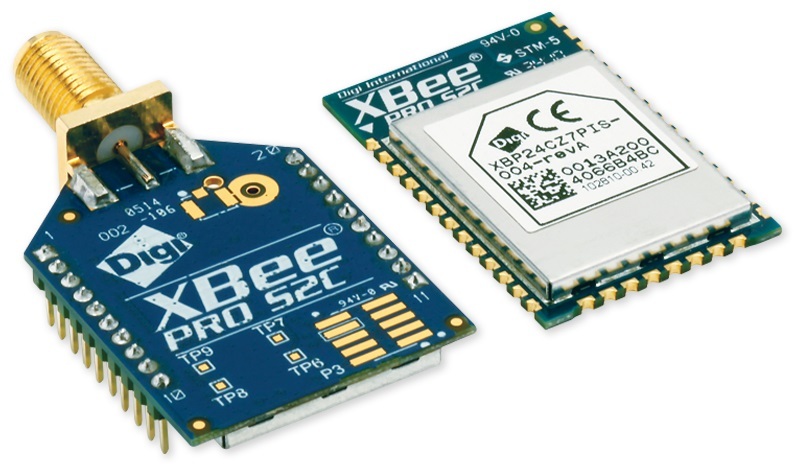 In most cases, customers use their own external microprocessor with our standard XBee modules.